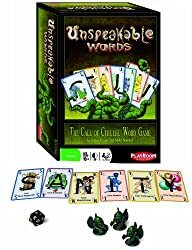 Unspeakable Words is a word game where you will attempt to form words from the letter cards in your hand. 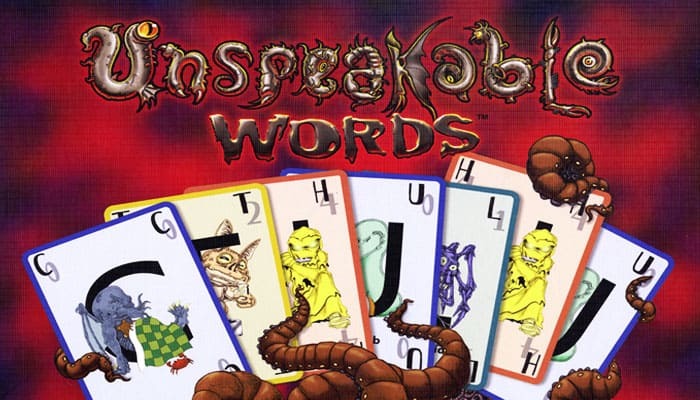 The deck consist of 96 letter cards and each player gets 7 cards to form their starting hand. The players receive also 5 tokens that represent their sanity. When you form a word, each letter is worth points and a 20-side die must now be rolled. If the roll is greater than or equal to the points of the word you can keep your sanity tokens, else you will loose one. You are out of the game when you don't have any tokens anymore. Your goal is to score 100 points without going insane. Shuffle the letter cards and deal seven cards to each player. The rest of the deck is placed face down at the center of the playing area as a draw pile. Give each player 5 Cuhulhu pawns. Each player rolls the die. The player with the highest roll goes first (re-rolling any ties), and play proceeds clockwise around the table.